My friend Kyle has an annual (for me it’s annual, for him it’s semi-annual) New Year’s Day Axis and Allies game. 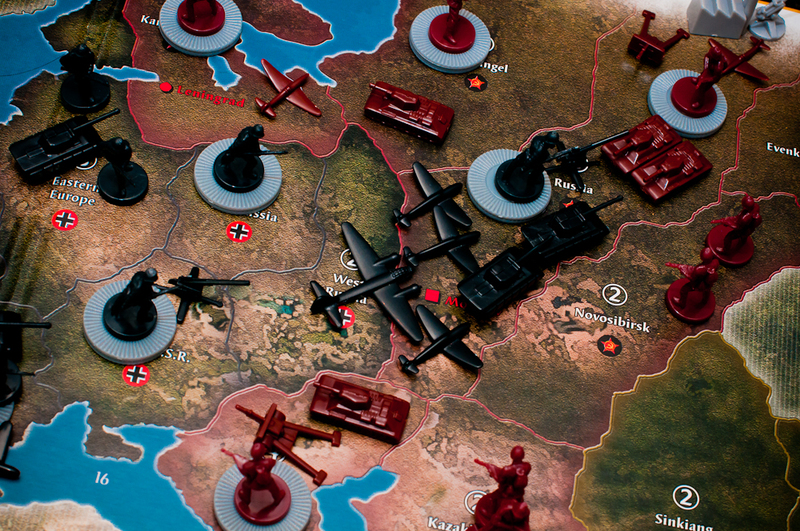 Basically, Axis and Allies, a strategy board game based on World War II (hence the name), is a game that is notorious for taking forever to play. In the version we played, Kyle was Germany, I was Japan, and we fought against the United States, U.K., and Soviet Union. We started the game at about 10 or 10:15 and finished at about 4:00. Yeah. It took forever. Not only that, but believe it or not, we didn’t actually finish the game. We got tired of it. And it helped that Kyle and I had already captured 9 out of the 10 required capital cities, had completely obliterated the Soviets (I had half of Russia, he had the other half), and had a considerable economic advantage, thanks to the countries we had taken control of. By the end of the game, I found myself just glad that the game was over. Good thing it’s only once a year. I don’t have an answer to that question just yet, and I probably won’t find the answer before I finish typing this post. But I do wonder if, during this conflict that ended approximately 70 years ago, either side asked themselves some of the following similar questions: Why are we doing this? What are we really getting out of it? Is it worth it? Strange as it is to play a game that takes several hours to play, after the first few hours, the game doesn’t really feel like a game anymore. It becomes a form of work. It’s no longer fun to think, to plan, to strategize. It’s not easy to keep going, and I can’t help but think that this feeling of fatigue is a microcosm of what was actually felt when the war dragged on for weeks, months, years. Why do I do the things I do? What am I really getting out of it? Is it worth it? Next Next post: Numbers, Motives, and Rainbows: Let’s Try to Relate these Three Seemingly Unrelated Things, Shall We?